Destination weddings are extremely popular these days and offer incredible opportunities to plan and enjoy a truly special and unique wedding celebration experience. As a Long Island wedding photographer I have had the opportunity to photograph weddings for people who have travelled in from around the globe to have their events catered at such prominent, world class venues as Oheka Castle in Huntington, NY and The Waldorf Astoria in NYC. I have also had the pleasure of traveling to my client’s destinations which have included venues in Florida, Maryland, California, Nevada, Virginia and the Caribbean. 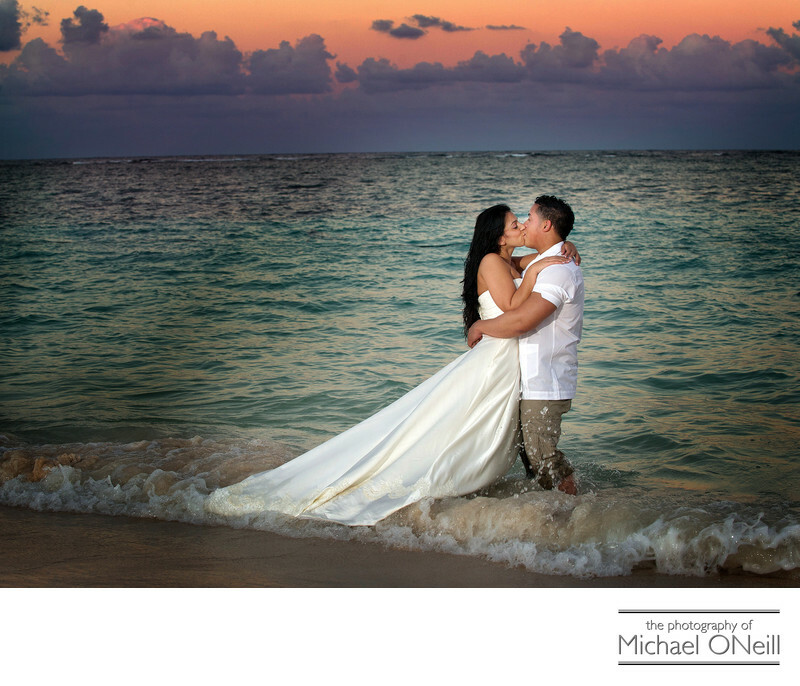 The destination wedding photograph you are looking at here was captured at The Majestic Colonial Resort at Punta Cana in The Dominican Republic. What an incredible trip this was...flying in two days before the actual wedding to scout locations and engage in a pre-wedding photo session with this fun-loving couple. The wedding day started with the bride’s preparations in her ocean view room, and the reveal at the top of the grand staircase in the hotel lobby where she descended for her groom to see her in her wedding dress for the first time. Photos were taken before and after the ceremony at various locations on the hotel compound including the white sand beach, tropical gardens and in front of the spectacular 1/4 mile long lagoon pool. The logistics of a destination wedding should only be handled by professionals that have extensive experience. You would hate to watch your photographer have his equipment confiscated or worse yet, hauled off to jail, because he or she did not obtain the necessary non-resident work permits to perform services in caribbean countries like The Dominican Republic. If you are planning a destination wedding give me a call. I would love to talk to you about all your wishes and plans for the big day with a view towards collaborating with you on an incredible, unique event.